So we’re counting down to London Film and Comic Con next weekend. We’ll be setting up shop at Olympia on Friday and Saturday spreading the word about Disconnected Vol. 1 and Lost: Boys. To get ourselves in the mood for London Film and Comic Con, we got to thinking about films and comics set in London. Lock Stock and Two Smoking Barrels – Because life is nasty, brutish, short and incredibly funny. And because Dexter Fletcher is a legend. Passport to Pimlico – A declaration of independence for a little part of London. One of the best of the Ealing comedies. 28 Days Later – OK, not technically a London film after the point where they bugger off to the countryside, but the bit that is in London is stupendous. Mary Poppin s – Now, don’t mock. It may have the most bizarre Cocker-ney accent in history but it’s a movie that has London at its heart and features oft-forgotten social commentary about the tragedy of homelessness and the duplicity of bankers. 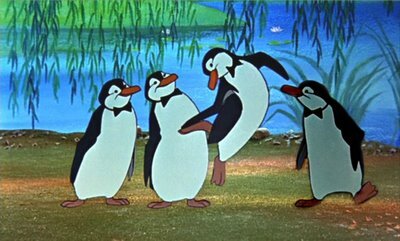 If that’s not enough, it’s got cartoon penguins. An American Werewolf in London – If any of you can walk through Tottenham Court Road station and not get freaked out, well, you just haven’t been paying attention. One of Conor’s all-time favourites. What did we miss? Tweet @DisconnectedPrs or email hello@disconnectedpress.co.uk and we’ll add to the list as the week goes on. And look out for our list of five London comics later this week!